Alfonso Cuaron (GRAVITY) returns to the Londo Film Festival with another technically superb film - ROMA - a loving recreation of his childhood in 1970s Mexico with a loving but chaotic extended family and his beloved maid, Cleo. The film is full of meticulously staged set design and long fluid takes that move through the luxurious family house. We see beautiful landscape photography and dazzling light over the ocean. Although I'm still not entirely sure why this needed to be in black and white. It's also worth noting the intensely constructed sound design that shows the street noises of Mexico and the dramatically crashing waves of the sea. There are some fantastic set pieces here. One is the recreation of a student riot turned shoot-out seen from the vantage point of a furniture store. Another is a tense fluid run through A&E as a pregnant woman is rushed into surgery. I also loved the thread of water imagery running through the film - from - the water mopping tiles in the opening credits - to the dripping tap and blocked sink in the kitchen - to the pooled water in the unpaved road as Chloe goes back to the slum where her boyfriend lives - to the cataclysmic waves at the end. 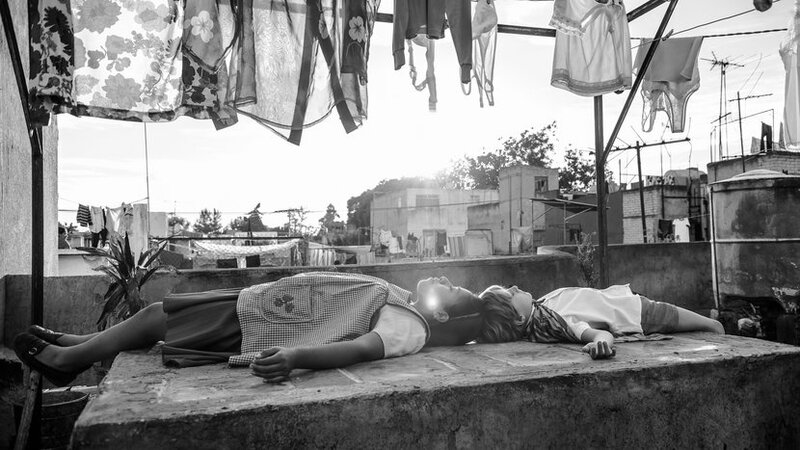 But for all its technical mastery ROMA actually bored me for much of its first hour. I was struck by the notion that just because childhood memories are precious to you, does not mean that they will be fascinating for everyone else, even if you ARE a master cinematographer. And this feeling of disengagement is exacerbated by the fact that Cuaron takes a long time to truly signal to us that Cleo is going to be the focus of our attention. Otherwise it's just a leisurely created family portrait. And then the second half of the film just launched us from crisis to crisis, all of which bordered on the unbearable and ended on a pretty hamfisted political point that no matter how much Cleo is "loved" by the family - and Cuaron who makes a film for her - she still gets consigned to the attic-roof. She's always just be an employee. I do rather wonder how complicated Cuaron's feelings are about this point, and would have loved to see that explored further. The only time I really felt it was addressed was when the grandmother of the family had to admit that while she loved Cleo she didn't really know anything concrete about her. I also felt that a final act declaration by Cleo at the beach - the only real glimpse we get of her emotional life - was utterly unearned. ROMA has a running time of 135 minutes. The film played Venice, Toronto and London 2018. It will be released by Netflix.